Stoptober has driven over 1 million quit attempts to date and is the biggest mass quit attempt in the country. It is based on research that shows that if you can stop smoking for 28-days, you are five times more likely to stay smokefree for good. There a lots of ways to quit and Stoptober can help people choose what works for them. 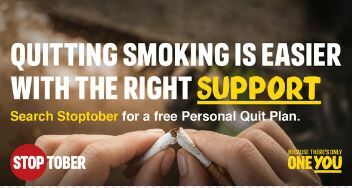 Stoptober offers a range of free support to help people on their quitting journey including an app, daily emails, Facebook Messenger and lots of encouragement from the Stoptober online community on Facebook. In addition, people can get expert face-to-face advice from local stop smoking services. Those who use stop smoking aids and who get face-to-face support from their local stop smoking service are up to four times more likely to quit successfully. This year, Stoptober will encourage smokers to find the most suitable support for them, rather than trying to go “cold turkey”.